Having met Anna outside Notre Dame I crossed the Seine and headed into the Latin Quarter. Paris offers a couple of superb features for street portraits; wide pavements on the boulevards and a range of dignified doors for backdrops. Moments after testing this door as a potential background, I spotted Kaori and her brother Akinobu were walking up the broad Rue Monge. Thinking that Kaori’s dense black hair and stylish black pashmina would work well together to frame her face, I interrupted their morning and they kindly agreed to stop. 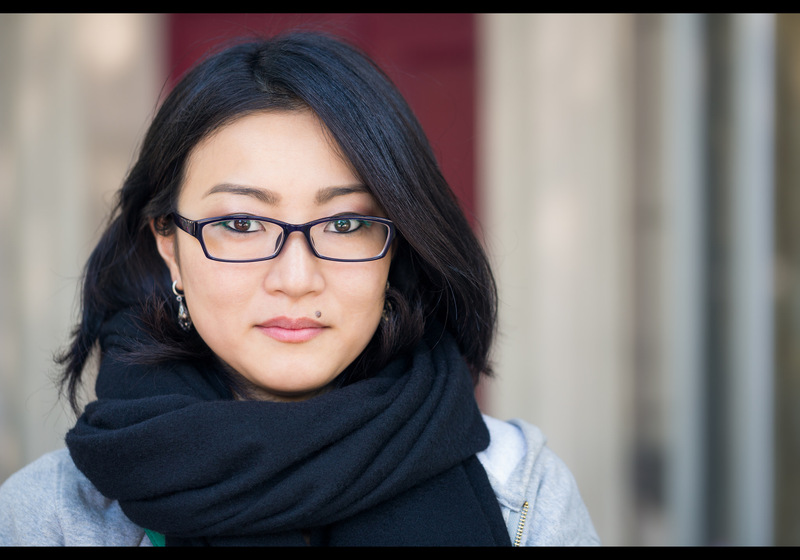 Kaori is from Japan, living in France as a full time student of French – which she finances working in a Japanese restaurant. Akinobu was over to visit and enjoying their exploration of Paris. It was a memorable conversation, conducted 1/3 in French, 1/3 in English and 1/3 in Japanese. The word すごい (“great!”) featured heavily and I felt we’d shared a great five minutes of mutual enthusiasm for the variety of places, people, cultures and opportunities the world offered. Akinobu then provided much needed help with a gold/silver striped reflector. Kaori beamed in some frames, laughed in others, but this more neutral, confident smile seemed the best shot to share. I left the turquoise ghost from the anti-reflective coating of her glasses untouched, thinking it might echo the tiny patch of turquoise below her scarf. This is portrait #47 of my 100 Strangers Project – check out the group page and get involved.